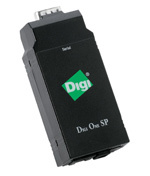 The Digi One SP Ethernet to Serial Adapter allows you to use Beagle Software's serial hardware over a network. The adapter acts a virtual COM port, allowing to access your serial device using any existing software. Due to the patented mapping of a virtual COM port, all programs (including DOS) can interact with the serial device as if it were connected directly to the computer. The adapter also features an HTTP web interface for easy set up and configuration that can easily be utilized across any Ethernet network.